Trademark filings discovered in Trinidad and Tobago, a popular place for Apple to secretly file future naming assets, show the company's next OS X 10.10 operating system may be named OS X Sequoia, OS X Mojave, OS X Sonoma, and OS X Ventura. 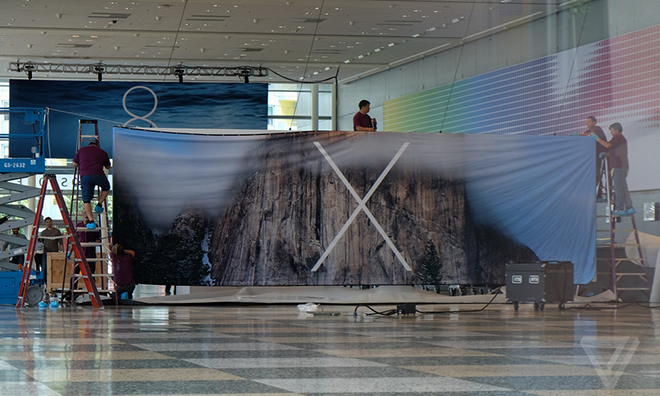 A WWDC banner highlighting the famous El Capitan monolith, however, points to "OS X Yosemite." The trademark filings were officially lodged with Trinidad and Tobago's Intellectual Property Office on Mar. 11 and cover the names "OS X Sequoia," "OS X Mojave," "OS X Sonoma," and "OS X Ventura," each of which is a well-known city or geographic feature in California. Apple is not specifically mentioned in the official documents' text, first spotted by MacRumors, though the company is thought to be behind the filings. Interestingly, the Trinidad and Tobago marks also mention two cities by name —Sonoma and Ventura —instead of a geographic region or attraction like Mavericks. It is possible that Apple may move to a city-based naming convention much like those used by other tech companies as code names for working projects. A picture posted by The Verge, seen above, shows a banner going up for Apple's Worldwide Developer Conference that appears to boast a cloud-topped view of El Capitan in Yosemite Valley. A single trademark for "Yosemite" was also discovered in the offshore filings, though the date on that property doesn't match with the "OS X" marks. Still, with El Capitan featured so prominently, it can be speculated that Apple may opt for "OS X 10.10 Yosemite." The filed trademarks may have been a smokescreen to distract away from the real name.